Total Body Resistance Exercise, commonly referred to as TRX, is among the new classes being offered this fall at California Baptist University’s Recreation Center. Erin M. Bremond, Group X instructor and personal trainer at the Recreation Center, explains that TRX is a suspension training program that depends solely on one’s own body weight. “It uses your body weight as either the weight or as a way to stabilize or make you less stable and puts you in positions where you are pulling and balancing your own body weight,” Bremond said. Because TRX depends on the person’s own body weight, anyone is able to do it. They are free to choose their difficulty and ease by moving further away or closer to the bar the suspension strap is connected. 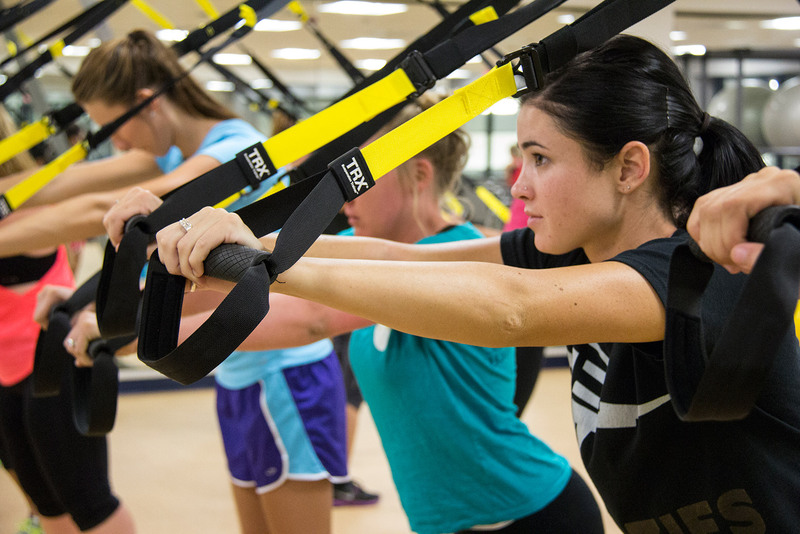 Aubrey L. Sipe, liberal studies graduate student, said she liked how TRX worked her entire body during the class. “I knew I was going to definitely be sore the next day,” she said. TRX workouts are usual very difficult. “You wouldn’t think that straps with handles at the end would make you sweat as much as they do,” Bremond said. The reason for the intensity is dependent on the basic position of all the workouts and the timing in which repetitions are completed. Every position done in TRX requires the body to be planked, making one parallel to the floor. One part of the body touches the floor while everything else hangs from the suspension. “Your core is always engaged; it helps you work your core without evening knowing it,” Bremond said. All movements and exercise done in TRX are functional, meaning that the movements done can be done anywhere else throughout the day in everyday actions. “What you do in the class can be used for what you do in life such as hiking, climbing or bike riding, because you’re using your core, your arms and your legs,” said Kristi Calhoun, Group X coordinator. Another great benefit of working out with TRX is the physique that will be achieved. “You build a more lean, athletic type of body frame as opposed to being big and bulky with very large muscles,” Bremond said. TRX Suspension Training is now available at the CBU Recreation Center on Monday at 5:30 p.m. and Wednesday at 6 p.m., taught by Calhoun.